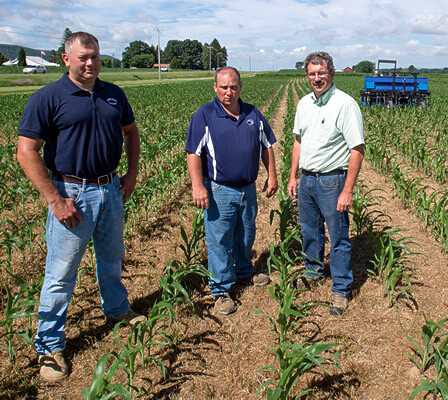 At the Penn State Agricultural Research Farm, developers of the InterSeeder established two studies to evaluate the potential of seeding several cover crop species at the time of corn sidedressing (V7 growth stage). We successfully established ryegrass, red clover, white clover and a red clover/ryegrass mixture interseeded into no-till corn, following both corn and soybeans. Since the establishment of the cover crop is after the "critical weed free period"in corn, any impact on yield are likely to be small, and more than offset by a combination of the savings in field trips and the value cover crops add.